As stupid as it may sound, the Flathead proposes to add 12 miles of user-created bike trails, like the one it photographed above left, to its trail system in the Desert Mountain and Lion Hill areas near Hungry Horse and West Glacier. 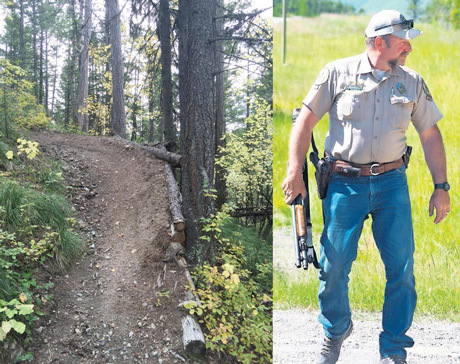 One of these "informal" trails was in fact closed temorarily while authorities looked for the bear that killed Brad Treat, a Flathead NF law enforcement officer that ran into the bear with his bike. Things were looking equally grim for the bear, as pictured in the Chris Peterson/Hungry Horse News photo in the Daily Inter Lake (above right), though the bear was not found. Local mountain bike advocates are now clambering to have these user-created trails sanctified by the Forest Service, as they have for non-permitted trails on other federal, State and private lands in the area, claiming no conflicts with wildlife exist! -To not authorize high-speed bike trails in the habitats of bears and mountain lions, as recommended by Montana Fish, Wildlife and Parks and the Interagency Grizzly Bear Committee! 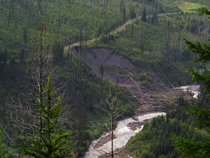 -To not reward reckless trail building that endangers other trail users, horses and wildlife! -To honor the memory of Brad Treat with a public safety program, rather than promote reckless and potentially fatal behavior! Click here to locate maps and more info about the Hungry Lion Project (a timber sale, road and trail management project). Comments are due by December 21! This is not a drill, it is not April Fools, it's a really stupid idea! Thank you for taking a few moments to speak up for the wellbeing of wildlife and people!